Archer on Airguns: Hammerli AR20FT - US Model Performance? Hammerli AR20FT - US Model Performance? For our www.archerpelletguns.com store - as well as others - gives the muzzle velocity as being only 560fps, which is hardly enough for field target shooting! How did we get this figure? Well, it's based on Umarex data. But I think there's a little confusion and I have a question in to the Umarex technical folk about it right now. I suspect that the 580fps muzzle velocity actually relates to the German market gun (which is rated at just 5.3 ft/lb in .177 caliber). There's also a 11.8 ft/lb version with a muzzle velocity of about 790 fps - this sounds much more like a sensible tool for field target use here in the USA and other countries that use the 12 ft/lb maximum for this discipline. A little searching on the German Umarex site (it helps to be able to read some German!) 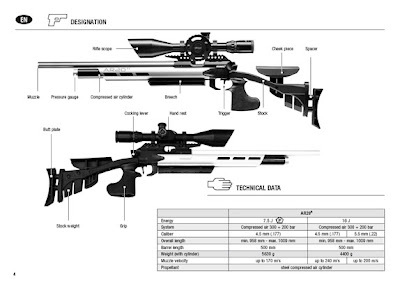 leads to a PDF of the instruction manual for the AR20FT and I've snapped a page below - the data is in metric units, 16 J(oules) is 11.8 ft/lbs and 240 m/s is 790 fps. And then there's the question of the operating pressure. Thee page here shows 300 bar (4,350 psi) and 200 bar (3,000 psi) options. Again I've asked Umarex which version will be coming here (or if there's a choice) and how many shots per fill will be achieved. I'll post the results once we have them. It is a 300 bar gun. You can fill it for just 200 bar pressure, if you want. There is regulator that drops they pressure down to about 130 bar anyway. For each shot, that is. For 200 bar fill you get about 70 shots with 16 joule energy. For a full 300 bar fill you get over 100 shots. Nice gun and has the two most important things in PCP gun done right, good regulator and quality Lothar Walther barrel. With right diabolo, usually JSB Exact Express in size 4.52 you can get under 15mm size groups / 5 shots, for 50 meters. -eSa- Thanks for the information. You supplied the answers to our questions faster than Umarex USA!!! Ian, thanks for your input. As this air rifle has not reached the USA yet, information like this is very useful to those here considering it for the future. So, Mr. Archer, which version are we getting here in the USA? Hopefully, it will be the 16 joule version. If that's the case, I may have to pick one up. Well, unfortunately the first AR20FTs to arrive in the US are low power models. This decision by Umarex makes no sense at all - in fact it's completely unbelievable to anyone with any understanding of field target shooting!!! However they are working to up-grade existing customers' guns to the correct power level and I believe that this will be standard in future. Confirmation of this is still awaited from Umarex, however. I spoke to the Umarex staff at the SHOT Show and they indicated that the ones coming into the country in 2012 are shooting at about 780FPS. I am in New Zealand and have owned the AR20FT for 6 months. The rifle's marketing is indeed very confusing as the brocure readily distributed is for the European market 6Fps version. Mine is 12Ftlbs and arrived in the country shooting 786 fps. Over the last 6 months it has settled in to about 806 fps which is a tad over 12ftlbs but still within our NZAFTA tolerances. It came with the 300 BAR cylinder that needs to be removed for filling, I fill to 220 BAR by Hand and refill at 150 BAR ( this is to minimise time on the pump) for this I get 60-70 shots. This rifle is a very accurate rifle for the money, but does benefit from a little cleanup of some of the internal CNC Machined parts. I am about to begin investigation to prove or disprove whether or not I am getting the occasional flyer from this rifle as I have had indications in the past of such and event and have read similar post's in very early threads. Will try to remember to update this thread if I find any pertinant info. After months of waiting Umarex USA finally sent me the parts (for just $86!?!). Now I have to figure out how to install the new regulator. My comment that the parts upgrade should be free was met with, "what's your credit card number?" With the new regulator the rifle is shooting JSB Exacts at 811.5fps. which is a .3 fp over the WFTF limit of 12. @Dave, you only get the regulator (466.61), no spring or so one ? Where can I get the regulator, I`m german ?